Eagle Claw Kung Fu Schools are Directed by Shifu Julian Dale, who has over 30 years experience in Chinese martial arts, having spent long periods of time training in Hong Kong, China and in America. Shifu Dales area of specialty, is that of Northern Eagle Claw Kung Fu it is this style that he has given a life long dedication to practicing. Shifu Dale is also a qualified health care practitioner, using traditional herbal remedies to treat martial arts and sports injuries, massage/manipulation and a qualified clinical nutritionist. 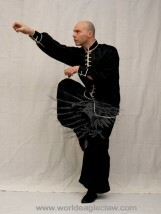 In addition to Eagle Claw Kung Fu Shifu Dale has been taught extensively in the Internal martial arts such as Ba Ji Quan, Qi Gung and Chen Style Tai Ji Quan by Master Jian Cheng Ji of HangZhou China. Shifu Dale has also received instruction and teaching by renowned internal Martial Arts Master Dr. Kenneth Fish Washington DC USA. It is my commitment to each and every student, to pass on the Eagle Claw system, as completly as I can, ensuring that a high level of quality is not only taught but retained by the student. There are no special magic or mystical skills, there is only hard work and preseverance. Shifu Dale has been seen on various Televsion and film programs demonstrating Eagle Claw Kung and with his students, in addition the school lion dance and demo team has also featured on Television. Shifu Dale has been featured in many Martial arts magazines over the years on eagle claw. Combat Magazine, Martial Arts Illustrated, Martial Arts Plus, Kung Fu Secrets etc.